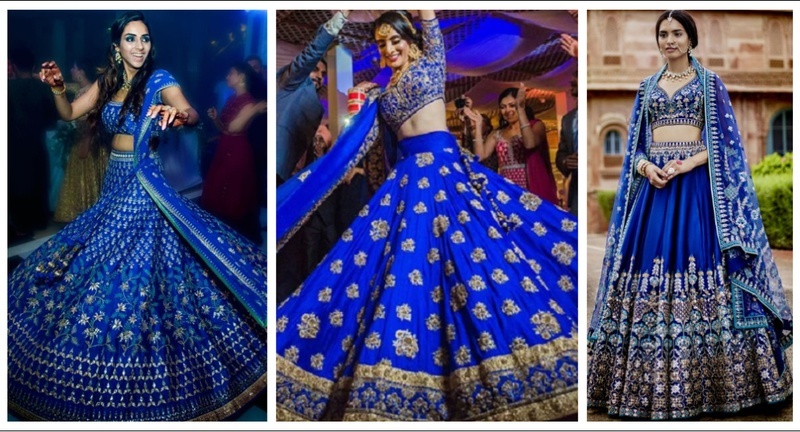 25 Blue lehengas for the brides who plan to ditch the reds and pinks! Give those reds a miss and say hello to the new trending colour of the season. Its Blue!! Have a look at this happy lady twirling in a beautiful blue lehenga choli. This simple yet intricate detailing with sequins all over looks stunning. The tassels on the dupatta add to the details! A very elegant piece, this floor-length navy blue lehenga in silk fabric is surely note-worthy. Patch work design of sequins in gold look simply striking. A plane lehenga In blue with heavy blouse work and a red dupatta for color blocking is a great choice for your wedding functions! A modern-day bride donning a beautiful bishop sleeves off shoulder blouse in blue. The flares are covered in golden detailing with blue shade peeking out. Love this banarasi bue lehenga choice of hers! A trendy piece by Papa Don’t Preach. The simple patchwork design all over the flares looks extraordinary. A pretty blue lehenga choli for sangeet, mehendi or reception party. The simple design of this piece makes it a versatile one. The sheer net dupatta adds to the overall look. A gorgeous navy blue lehenga with heavy embroidery on the flares and around the waist! Totally in love with the embroidery on the blouse & the lehenga and the sheer blue net dupatta with some work on it! A very elegant navy blue lehenga choli with broad zardozi work enhancing the look! Those gold kaleeres totally add to the entire bridal look! What is a lehenga if not Sabyasachi? A magnificent blue lehenga covered all over with intricate detailing, broad zardozi work on the flares and a net dupatta. Another one with a very broad zardozi work on the flares edged with a hint of pink. This royal blue lehenga choli is a perfect one for a sangeet night to flaunt those flares! This blue lehenga in silk looks absolutely fashionable. The embroidered flowers and the sequined blouse in copper will instantly lift up your fashion quotient. Net lehenga in blue with pink embroidered flowers all over the flares. The motifs are weaved on the top most net layer with multiple layers of cloth below, providing the dense look! A very traditional blue lehenga choli with golden patch work all over the flares. This twirl in blue lehenga surely makes your heart skip a beat. A very exquisite piece. This navy blue lehenga has embroidered dupatta and ghagra. The beautiful zari work in golden thread adds the bling factor. A glittery blue lehenga in georgette fabric will surely make you the cynosure of all eyes. This royal blue lehenga combines with golden zardosi work, creating an attractive look. Totally digging the golden belt on the waist holding the dupatta in place! This bold color is what you want at your wedding. The heavy work at the bottom gives a very rich feel to this dark blue lehenga. Looking for a light weight lehenga so that you can sit calmly through the rituals? This blue lehenga with a sleeveless blouse and golden work is sure the thing. Attending your best friend’s wedding? Here is a design you cannot take your eyes off. This blue lehenga with a bold blouse in plain blue is an inspiration. A trending shade, egg shell blue. This light blue lehenga with intricate golden detail is a piece of art. An unconventional combination in yellow and blue. The powder blue lehenga with yellow frills is surely something unique. This bride’s egg shell blue lehenga is a stunner piece! This egg shell blue lehenga in sparkling sequins will surely grab all eye-balls in a party. The perfect bridesmaid lehenga with tassels that will instantly make heads turn! So get wedding shopping girls!